One of the good things about de-cluttering is that I am finally finding space to display beautiful things. Like these delicate little glass bud vases from Cox and Cox that I was kindly given from the lovely folk atNotOnTheHighStreet.com. I’ve had them a while, but because of their fragile nature and small stature, I’ve resisted putting them out on display. Firstly because I was worried about breaking them, but also because they’d get lost amongst the clutter! Small things need space to shine and I’ve finally got that, after lots of work tidying up. I have a set of eight, two each of the four different colours shown in the photo; Atlantic Deep, Dark Olive, Soft Mole and Iron. I think the colours are perfect for this time of year and they all look great against the plain grey walls of my bedroom or in my sitting room by the fire. 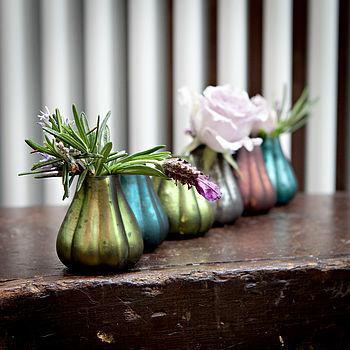 I love having little displays of seasonal flowers on my bedside table and on the fireplaces in my bedroom and in the sitting room, and these jewel coloured little vases will be perfect for bringing a bit of sparkle to the room over the winter, before they are used for tiny posies of the first spring flowers. They look especially lovely placed alongside candles, so the flickering glow of the light reflect the colours and bring a bit of warmth to the colder months. With many thanks to NotOnTheHighStreet.com for sending me these lovely vases to review.